The days are becoming warmer and lighter for longer, we are well and truly into Spring. And that means everything in the garden is coming to life and starting to grow....including weeds. The Dandelion with its bright yellow flowers which turn into fluffy seed heads, a puff of wind and they fly into the air like little fairies. Onto today's mani, using Dandelion Water Decals from Charlies Nail Art over a dusky pink and sky blue gradient base. If you've not tried water decals before, give them a go, simply soak in a little water, remove from the backing paper, apply to your painted nails and seal with top coat - done! 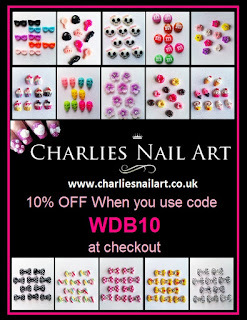 The 'Dandelion' water decals currently costs £1.00 and will cover 10 nails. 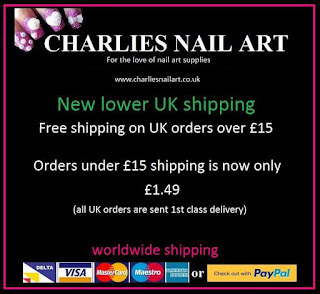 Available at Charlies Nail Art who have an huge range of nail art items. The designs of nail arts are fabulous, also perfect for this spring, thank you for sharing this blog.